Hello! I'm going to start off with saying thanks for reading and this is my FIRST EVER posted review of a game... hope you enjoy. This game is a sequel to the original falling just years after the ending of the last game. The hero finds himself in jail because of a ban on bio-engineered soldiers and the army brings you out off jail to help save the day. Now that you have the basics of the story, lets go to gameplay. This is where the game left me hanging... and swinging... by the neck. 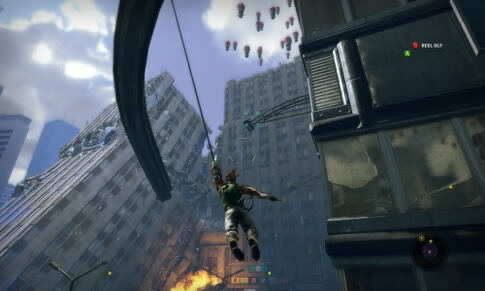 The controls of this game actually aren't too bad, the camera could use an overhaul and the swinging physics, well there basicaly are none. You throw your hand and grab any object and the swinging is just straight back and forth and let go at the arc. I really wish that they would have barrowed some of the swinging physics that Spider-Man 3 used. Most of the levels are drawn down to a basic, swing across this radioactive gas pit -> kill this baddie -> swing to the exit over this pit of water. The baddies of the game are quite brain dead. They typically run out into the open and just fire. The weapons were alright as long as you could use the over-the-shoulder view, but the regular side firing is really bad and mostly useless. I ended up finding myself using the exact same attacks to defeat every single foe, jump -> grapple -> zip kick. All and all the game was way too repetitive for me and unless you are a fan boy of the series, than I suggest that this game is not for you. Awesome review! Our site is all about posting your own opinions and you did just that, good job. p.s. Make sure to keep'em coming!